One evening, a week or thereabouts ago, I decided to take some selfies. It was late in the evening and power was out, but I decided to take the pix anyway. Naturally, they turned out to be grainy. But I kept them and the whole episode got me thinking: Why do we often wait for circumstances to be perfect before we do what we’re longing or we’re supposed to do? Why do we think our lives need to be perfect before we can be happy and count ourselves accomplished? Yeah, so what if the pictures turn out to be a little grainy? What if the pay rise you’ve been hoping for still gets delayed? What if your kids don’t take the first position in class always? What if it rains for a while on your crusade night? What if, what if …? Believe me, there are always going to be “What ifs”, lots of them. But don’t let them steal your joy. Don’t let them stop you from doing what your heart is asking you to do. Don’t let them distract you from appreciating the things that God is doing in your life now, imperfect as it is. So if the time you’re in is late evening and you feel like it, take those grainy pictures and save them. When the light returns, take the sharper ones and save them too. Side by side, they will give you a more complete view than if you had one type alone. And then when occasion demands, you can help others see the beauty in all. I believe you catch my drift. But if not, the following scriptures will help. 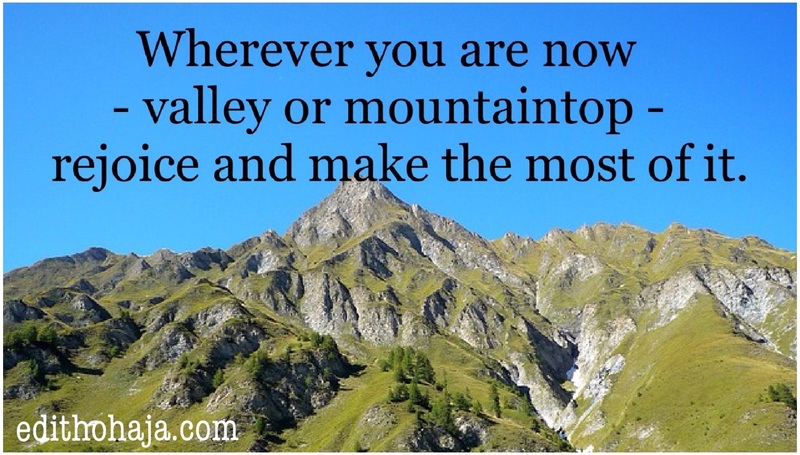 So wherever you are now – valley or mountaintop – rejoice and make the most of it. If you’re in a negative situation, that may turn around at any moment. But in the meantime, find out what God requires of you and be about it with all that He’s put inside you. 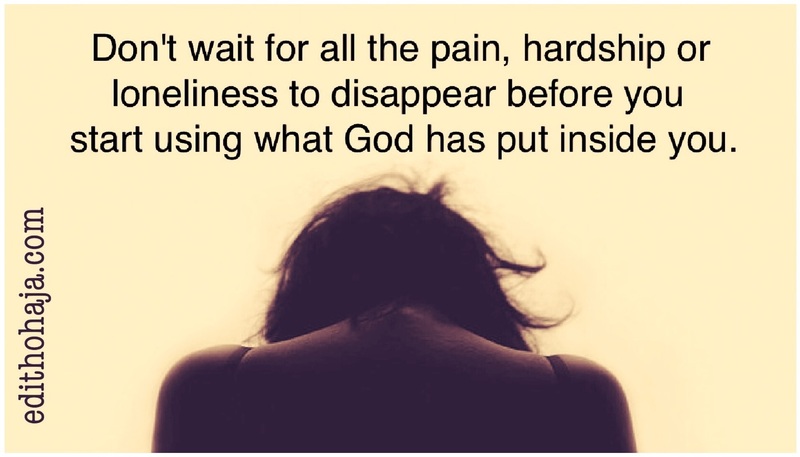 Don’t wait for all the pain, the hardship, the loneliness or whatever else to disappear before you start singing those melodies or writing and teaching those Bible lessons you are receiving, before you start reaching out to the needy with the little that you have. Nothing is perfect on this side of heaven but we must do what we can as the Spirit leads and strengthens us. And we will continue to rejoice in our Maker who makes all things beautiful in His time. Amen in Jesus’ name. Great message! Thanks for sharing your words :) Blessings to you! Thamks for your kind words, Keri, and blessings yo you too! Thank you, Marisa! You are blessed! oh! waow.....this is a lovely story u are blessed. Praise God! And thank you! I appreciate. Glory to God! Thank you too. May God give us the right disposition in Jesus' name. This story is indeed, a composition of advise and courage with biblical instances to all those who are confused with the ups and downs of this world. God said in his word that all those who are thirsty should come to him and get filled. thank you very much my wonderful lecturer and God bless you. Wow, this is great, please continue to do the good work you have started. Stay blest. Your words are of great comfort and great inspiration. Thanks for sharing such piece with the world. God bless you ma. This is really encouraging and uplifting. Thanks alot. THIS IS REALLY REALLY ENCOURAGING AND INSPIRING.THANK YOU VERY MUCH MA.THIS IS A WORD IN TIME.I APPRECIATE.PLEASE WE NEED MORE OF THIS. Blessed by this post. "WHAT IF'S" has been a problem to me for a very long time. What if I fail, what if I fall. Now I know. Wow!! I love ur words aunty..It gave calmness to some of my worries. This was a blessing! Perfect message! very intelligent and inspiring writeup. nice write up.thanks for the word of encouragement ma.its really inspiring. Thank you, Ezinne, but it's one of my musings, not a short story. I love your analogy of the grainy pic. thanks ma'am. it is inspiring indeed. your words are like drops of water sipping in. whether grainy or perfect,i'll always see the beauty in life. this are purely words and admonition of wisdom,ma u sure have a ministerial calling...i think this write was specially for me. Praise God! It is well with you, Bright. Your words are Inspiring..Thank You so much. Amen. This is very interesting and inspiring. Thank u ma'am. A well written reminder to try to be content in all circumstances. Lovely! Thanks, ma. We so long for perfection. But first, we need to take things one step at a time. The lines will fall into pleasant places. This is wonderfully creative, nobody would ever think of how this title evolved to a beautiful piece of encouragement. Wow.....this is cool...we should always turn a perceived weakness to strength. This in particular has struck me to be still nd always be joyous in my hrt..putting God first in my life nd makings things work no matter the imperfections in my life..no matter the pains..i love you Jesus and am glad you died to save me..am free! Am happy! I can move mountains.. Your words are filled with wisdom overflowing. It is true that we want a perfect situation to make a move, a perfect account balance to give out a loan or start a business.. .nothing is perfect and if we continually wait for the "perfect time" we might just find out that we have lost a lot. Wonderful work ma!!! We should be the one to position our situations and not the other way round. We determine our fate alhough as humans, we are limited and imperfect. Thank u, ma!